In this section, I will attempt to describe the Order of Chilam Balam's background, and the great spiritual mystery of the Indwelling God. In the Order of Chilam Balam's chronicles (1876), the group is said to based its philosophy from the right branch of the Order of Hiram of Tyre, the principal architect and engineer of Ancient Master Builders of Ur of the Chaldeans. (A.J. Holman Company Dictionary-Comcordance, 1925). We do not know at what time nor from what source the legend of the Master Builder came into the ritual, but there is evidence that it was known to the English Craft before the so-called "revival" of 1717. "The Master's Part" as the legend was then called, appears to have been separated from the work of the entered apprentice, and fellow-craft degrees and elaborated in substantially the form of the present Third Degree sometime between 1717 and 1738. A model of the Temple of Solomon, or what purported to be such, was exhibited at London in 1724 which attracted many spectators, doubtless including Freemasons, and aroused much interests with comments and discussion. The drama of the Master Builder, the origin of a Fraternity, the ritualists, all came under the inspiration of the Temple, and thus encouraged freely upon the sacred volume and to enshrine the drama in a setting of scriptural symbolism (Rafael Girard, Los Chortis Ante El Problema Maya, 1949). Currently, the Mayan Order of Chilam Balam (Orden de los Balam y sus Nueve Grados) consists of 36 members (seven members in each continent plus the Divine Tzaddik), the Jewish concept of the Lamed-Vav Tzaddikim, and they are considered people in exile. The lam-who what? Lamed is the 12th Hebrew letter with the numeric equivalent of 30, vav is the sixth Hebrew letter equating to 6 so Lamed-Vav is another way of saying 36. Tzaddikim are considered righteous men. the numerical value of ‘lo’ is thirty-six and refers to those who see Him through a bright speculum. Shechinah is roughly translated to mean Holy Spirit or Divine Presence and only thirty-six people see Him with absolute clarity." Therefore, there are at least 36 righteous men in each generation who have a special bond with Hashem (God of Abraham, Isaac and Jacob) and without these lamedvavniks the existence of the earth is threatened. These men are humble, nondescript persons hidden throughout the world who are only brought to the forefront when disaster is threatening to strike. If you were to meet one on the street you wouldn't be able to tell as they are concealed until the time they are needed. When danger appears they come out of their self-imposed anonymity and with their close bond with Hashem defeat the foe and then sink back into the sea of humanity. Discovery of the identity of any of these righteous men is to be kept in strictest confidence. They perform Tikkun Olam - the healing of the world. They go unnoticed by others because of their humble nature and commonplace vocations, such as archaeologists and artisans. However, in times of great danger, the Lamed Vav Tzaddikim make a dramatic appearance, using their hidden powers (supralogic and metaperception) to defeat the enemy. Then they return, as mysteriously as they appeared, back to anonymity (in Hebrew, nistarim). As long as the Lamed Vav continue to serve humanity and God in this fashion, the world will go on. But if at some point God will not be able to find someone just and good enough to replace a dying Tzaddik, the world will end immediately. According to Yoma 38b, one righteous man can ensure the existence of the world, and he's included as the Divine Tzaddik (not to be confused with the Messiah or Moshiach) in the group, the one with psychic powers to see the future. No sooner is one righteous man removed from the world then he is succeeded by another righteous man as good as he. The righteous man is he who is saturated with the Sacred Word (e.g., Torah, Bible, Koran, Popol Vuh, etc.) and possesses within himself the instrument of dealing a deadly blow to the evil inclination (yetzer ha-rah). "The righteous are considered as alive even when they are dead because they can appear again in future generations." (Berachot 18a). The marks of a righteous man, according to Jewish principles, are the sincerity of purpose and the strenuous endeavor to accomplish it. The righteous man who has fallen into sin is distinguished by his repentance, as in the case of King David. 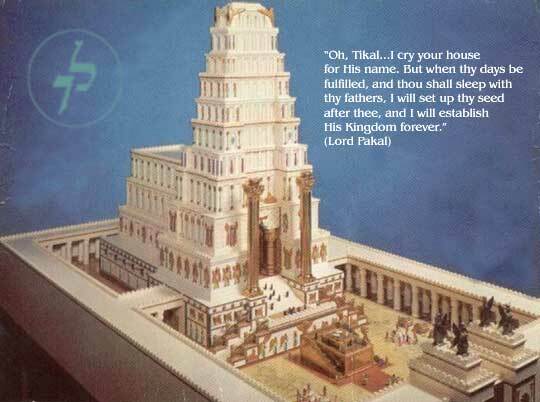 The last Pakal is the last Divine Tzaddik, and said to descend from the Great Davidic House. He has ruled that among the 36 members, 7 women should be admitted in the group, and his decision was agreed. He lives in anonymity until the gathering of the 36 takes place in the year 2012. When the world was an abyss, when there was neither light nor darkness, the cosmic star was born, after the divinity of the ruler was created, when there was no light. Then there were born seven tuns, seven katuns, hanging in the heart of the spirit, the seven chosen ones. Then, they say, their seven words stirred also. Seven also were their holy images. While they were still untarnished, occurred the birth of the first creature, the first infinite, when there was infinite night, when there was no God. Not yet had he received his Godhead. Then he remained alone within the dream, within the night, when there was neither light nor darkness. Then he departed at the end of the katun, as he could not be born in the first katun. There were his long locks of hair as his Crown, his divinity came to him when he departed. Thereupon he became man in the second infinite time. Then there arrived in the second katun, Alpilcon, as the creature was named when she was born. The second creature was permitted to depart in the second infinite night, when no one was present. Then she received her divinity, alone and through her own effort, when she came to depart. "O firmar" she said, when she received her divinity by herself and through her own effort. (As originally learned from the traditions of the Chilam Balams). LINK: For more information, please read Esotericism of the Popol Vuh (Theosophical University Press Online Edition, Pasadena, California) written by archaeologist Rafael Girard, and originally published in Spanish in 1948. NOTE: Although the symbolism of the Order of Chilam Balam and the Nine Degrees has dissapeared as a ritual, it continues as a group in modern times under the name The Pakalian Group. In our current mission, the Pakalian Group serves as an information repository of Mayan Patrimony that have been lost or disappeared during our time. The volunteer program consists in distributing this information of Mayan artifacts, disseminated throughout the world, to the original source, which is the National Museum of Anthropology in Mexico City. If you know of objects that could be returned to the original source, please click here to contact The Pakalian Group or you can contact the Institute directly through their website.